Corey’s Notes: This one little trick changed how I invest forever. It’s easy and you can even teach it to your kids. The faster you learn this trick the more your investments will grow. The number one factor on the mind of every investor is how much their return on investment will be. The whole point of investing your money is watching it grow and taking advantage of compounding interest. However, understanding how quickly you’ll see your investment increase can be difficult to figure out. There are involved mathematical equations that can help investors to calculate their return on investment, but the easiest calculation to use is the “Rule of 72”. The Rule of 72 is a calculation used to estimate how many years it will take to double your investment. The rule expresses that you take the number 72 and divide it by the average annual rate of the investment to calculate about how many years it will take to double the investment. Remember, while performing the calculation you should use the percentage as a whole number, not a decimal. For instance, if the average annual rate is 9%, you will use 72/ 9 for the equation, not 72/ .09. The following are some examples of the Rule of 72 being used for various investments. The average annual rate on a certificate of deposit is about 1%. Most private mortgages yield between 9 and 12% for an annular rate of return. Let’s use some investment amounts to see how quickly your investments will double. The chart below shows how quickly the original investment will double based on the Rule of 72. • The 3% investment will double every 24 years. • The 6% investment will double every 12 years. • The 9% investment will double every 8 years. • The 12% investment will double every 6 years. This chart shows the incredible power of compounding interest. • After your original investment doubles, it will take even less time to triple. Once it quadruples, it will take even less time to increase by 5, 6 or 7 times. Compounding interest allows your initial investment to grow at exponential rates. • You can see the importance of choosing an investment with a higher return on investment. After investing the same amount of money with interest rates of only 4 times different (3% and 12%) after 48 years the difference in the end amount is $2,520,000 or 64 times more. That is an astronomical difference. The rule of 72 works best for fixed rates of return. On investments that yield variable rates, it is impossible to know exactly when you will double your investment. Most investments do yield variable rates of return and the rule of 72 can be used for these investments. Find out what the average rate of return is on this type of investment and use that number in your calculation. Just keep in mind it may be a little sooner or a little longer until you double your original investment. The Rule of 72 is just an approximation. There is an actual equation that will give you the estimated time to double your money, however it is too complicated to do without a calculator. Most people cannot calculate logarithms in their head. That is why it is much more convenient to use the simple calculation of the “rule of 72” to figure out when your money will double. • The Rule of 72 is calculated by estimating the annualized rate of return over the investment of a loan. If the average rate of return is 10%, some years may yield 6% and some may yield 14%. Using either of those rates won’t give you a realistic vision of when your money will double. Try to find out the average annual rate of return and use that number while calculating the rule of 72. • No equations or calculations will tell you exactly how long it will take to double your investment. These equations cannot factor for changes in the market that will affect your annual rate of return. • The Rule of 72 works best for investments that yield between 6% and 10%. For average annual rates outside of this range, it is recommended to adjust the rule by 1 for every 3% above or below 8%. For instance, use the Rule of 71 for an average annual rate of 5%, and use the rule of 73 for an average annual rate of 11%. Adjusting the rule will give you a more accurate representation. Another item that weighs on the mind of investors is inflation. Over time, the value of the dollar decreases. Investing in strong financial products and utilizing the power of compound interest can help counteract inflation. 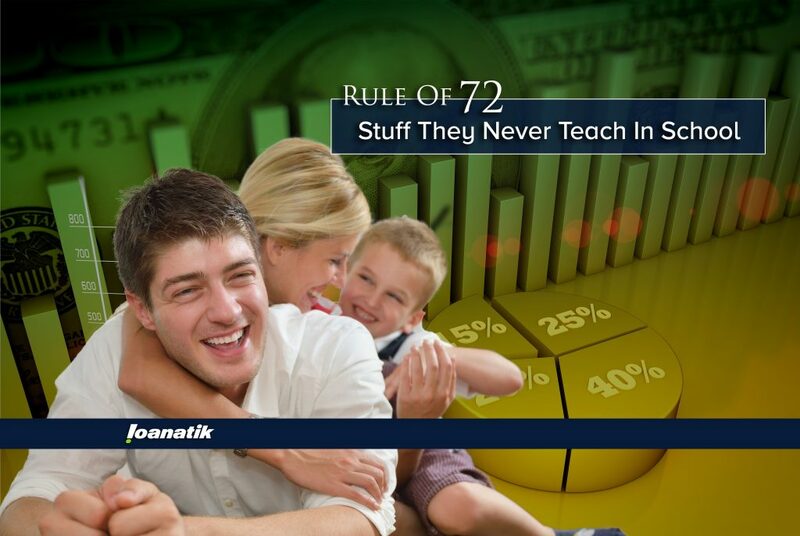 The Rule of 72 can also be used to determine when your money will lose half its value. For instance, if the current inflation rate is 1%, you can expect your money to lose half its value in 72 years. However, if the inflation rate jumps from 1% to 2%, you money will lose half of its value in 36 years instead of 72 years. In 36 years, the investment will double 6 times over. However, after 36 years, the money will lose half its value due to inflation. Meaning the value of the money 36 years later, would be like having $320,000 at the original time of investment. This is still 16 times more than if the money were never invested, and 32 times more than if the money never increased in value and were still only $20,000 in an account. Any financial advisor will recommend that you have a diversified investment portfolio in order to protect your financial interests yet yield the greatest return possible. There are several investment vehicles available and each has its own rewards and risks involved. It is important to balance your investments with money in various types of accounts. Every investor should have some money in low interest bearing accounts such as a money market or certificate of deposit. These accounts are much less volatile and provide a quick way to access funds. Then they should look into accounts that yield a higher interest rate but may have a more volatile market such as mutual funds and stocks. Lastly, investors should look into investing in secured private mortgages as a way to enhance their investment portfolio and yield even more interest on their investments. Private mortgages are one of the most advantageous investment vehicles that many investors overlook. Investing in private mortgages provides a regular and consistent income stream for investors. Private mortgages are an asset based loans through a secured debt obligation. The rates for private mortgages exceed the returns on most other investments exceeding 10% annual rate of return. Private mortgage investments yield a higher rate of return. Private mortgage investments are more secure than using other investment vehicles. In case of default, investors have access to the property secured by the lien and recoup any losses through the value of the property. Investors can use compounding interest to increase investments in more secured real estate and yield an even higher rate of return. The returns produced by private mortgages are not directly correlated with stocks and bonds. Therefore, if your stock portfolio has a bad year, you can still yield strong returns within private mortgages. Adding private mortgages into your investment mix can reduce the volatility of your investment portfolio. Doubling your investment is not only a possibility, but a reality while investing in private mortgages. Private mortgages are proven to be one of the most secured ways to invest your money within the current market. With annual rates averaging between 9-12% you will see yourself doubling your money in a short amount of time. Look into the various investments available to you and use the Rule of 72 to see what investment vehicle will allow you to double your money.